You can find Jutta here, and here is her Ravelry group. Everywhere - In Architecture, Techniques, Materials, Surfaces, Nature, Fashion, Movies … – There are so many ideas, that I could preoccupy myself for the next two hundred years … so exciting! Sometimes I wake up during night with the solution of a construction problem or with a new idea - there is always a little pad on my nightstand for notes and scribbles. A new technique with every new project! And: mindless stockinette stitch. To my opinion, a new design is just a new way to interpret and combine what one has seen somewhere someday. There are so talented designers, so many inspiring ideas! Wouldn’t it be a pity to miss them? When I started knitting, I had a grandma and a yarn store, where I could ask for help. If you order your yarn and pattern online, you are alone. And then a detailed pattern is quite helpful. On the other hand, a pattern for a simple sweater, with 10 or more pages of instructions, might be quite a deterrent. To me, this is a funny question, as my way was the opposite around. My first patterns were very simple. Similar to 80-ies style German Knitting Magazines, just the most important instructions - expecting the knitter to know what to do (or where to ask). Now my patterns are much, much longer and detailed. Including schematics, row-by-row and stitch-by-stitch instructions, pictures of details, photo tutorials for uncommon techniques, and, and, and … But I will not teach the basics. This is the job of knitting classes – or YouTube. Usually 1-2 per size and language. My first prototype is knit by myself, sometimes a second one is necessary. Fortunately I have a pool of very helpful and patient test knitters – they all deserve my particular thanks! Actually my knitting and designing is not a real business. 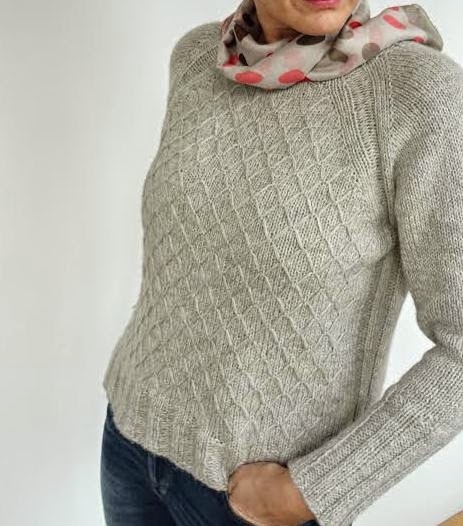 But I take it very seriously and try to act as professional as possible, spending uncountable hours to bring a new pattern along, responding to any question within a few hours and spending a lot of time in my Ravelry group. Not in a common sense. Except if you would accept my husband as a mentor? – Or the many friendly knitters on Ravelry who supported my activities with their nice comments and warm hearts! My little “designing-career” started by chance, when I discovered Ravelry. The positive response to my first project was absolutely unexpected, and a knitter asked if there would be instructions. That’s how my first pattern occurred. - And then so many knitters downloaded this first pattern! That was a real WOW-moment. (In the meantime I learned, that free patterns are always popular, but at that time it inspired me to continue). Much later I started to look around what other designers do. And tried hard to act more professional. Oops, that’s my weak point ... I have a Ravelry group that keeps me busy. Up to now I did not find the time for a homepage or any other social media. I know, this is an omission in modern life, but I prefer to spend my time knitting and writing patterns. Not yet, but I have often, very often thought about it! All my patterns are tested by experienced knitters. Of course it might be easier and time-saving to employ a tech editor, but some issues appear only while knitting a piece. 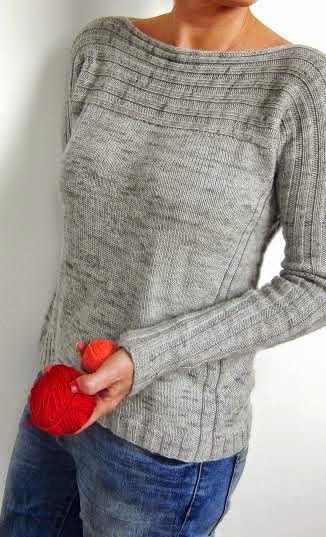 It is very helpful to hear the opinion of a knitter working through the pattern. If you ask my husband, he would tell you that 110% of my free time is filled with knitting-stuff. Actually it is only 90%. Any feedback is welcome and important to me. It helps to improve. Do not hurry. Give yourself time to review and rethink what you are doing, and how you are doing it. 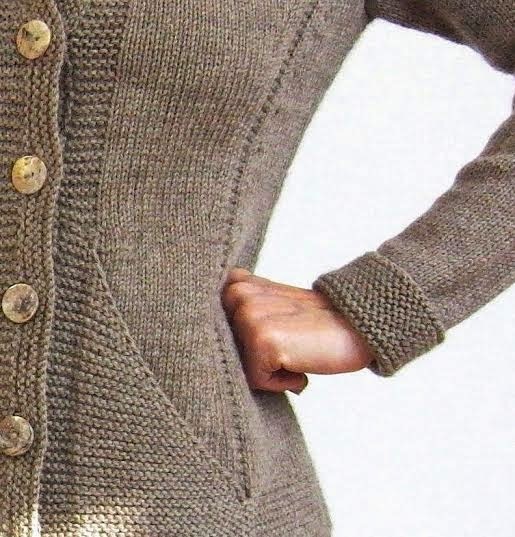 The release of my Cross Pockets Cardigan is planned for the next few days, and two more cardigans are on the way. This summer’s program is a revision of my older patterns (the ones in “German abstract style”). And there are so many new ideas that want to be knitted … every moment a new one arising!